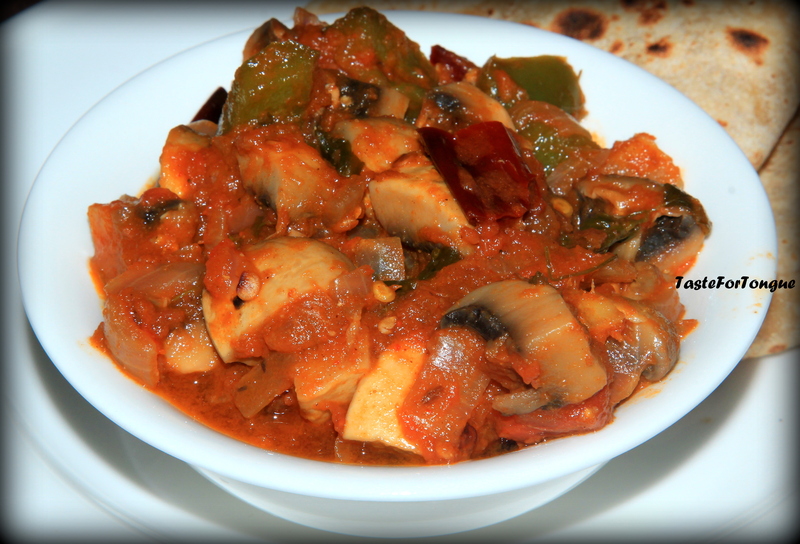 Here comes another popular mushroom recipe, Kadai Mushroom. Button mushrooms cooked in tangy tomato gravy and spices together. It is semi-gravy which goes well with chapathis and rotis. 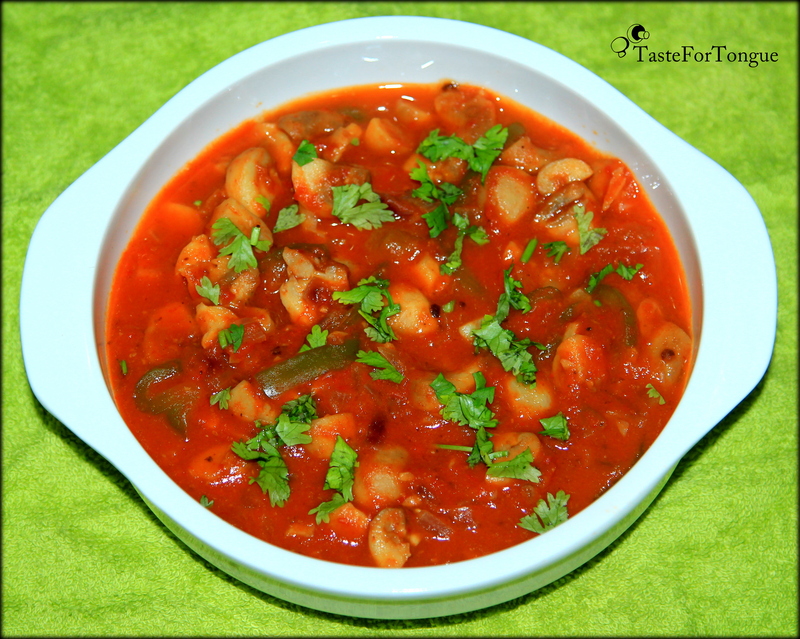 This yummy mushroom recipe is very simple and in the same way you can also prepare Kadai paneer. In a pan add olive oil, ingredients under tampering and chopped onions. Fry until onion turns translucent. Add chopped mushrooms, cubed capsicum to this along with salt, little water and let it cook. If you want the capsicum to be little crunchy then fry it along with onions rather than cooking it with mushrooms. Close the lid and let it cook well for 4-5 minutes. Mushrooms are rich in nutrients, mainly Vitamin D. Vegetables with Vitamin D are very rare and if you are a vegetarian then this is your perfect source for Vitamin D. Consuming it at least once in a week is good for health. 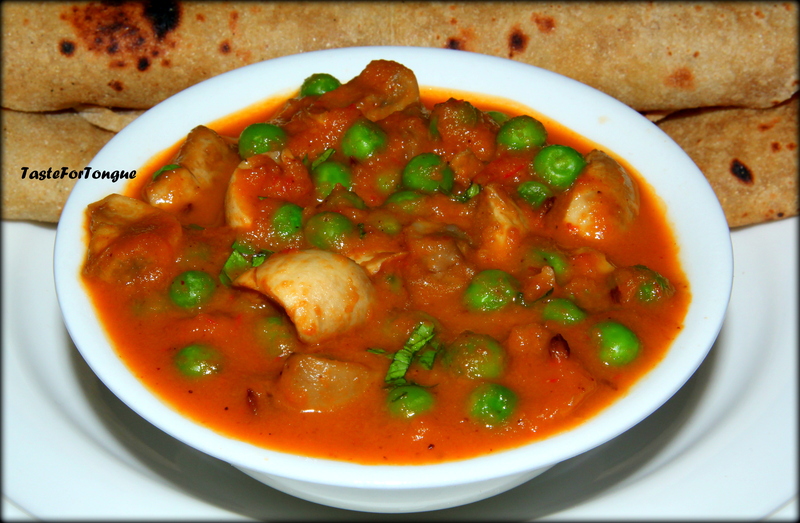 Mushrooms go well with green peas and I prepared this classic dish of North India- Mushroom Matar Masala. In a deep pan fry green chillies, garlic, onion and tomato. Grind it into smooth paste. Anyone who likes mushrooms will love mushroom gravies. I am crazy about mushroom fried rice, noodles, manchurian and gravies. Recently I prepared chilly mushroom gravy with an Indian twist. Its perfect for naan, chapathi and fried rice. You can make it watery or thick, spicy or sweet and tangy by changing the ingredients. When it is prepared at home you can eat it healthy, that way you can make sure that the mushrooms are fresh and of good quality. Add a tbs of olive oil to the deep pan along with grated ginger, finely chopped garlic, green chilly and onion. Fry well until the onion becomes translucent. NOTE: You can make the gravy more thick by adding another tbs of cornflour in water mixture. And any sweet and tangy sauce can be added instead of chilly sauce for sweet taste.